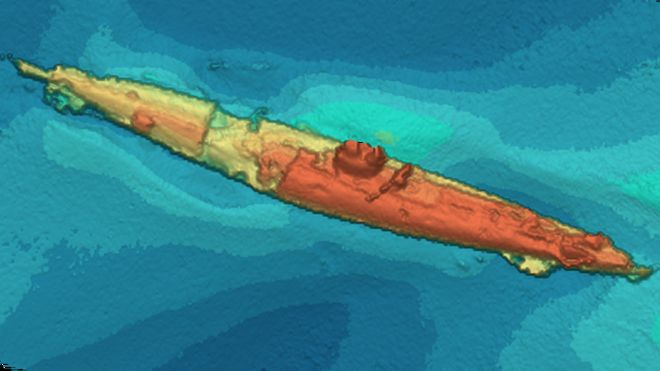 by Gilles -Martin Raget and Guilain Grenier "GMR+G1"
The wreck of a German U-boat that sank almost 100 years ago has been discovered by engineers laying subsea power cables. 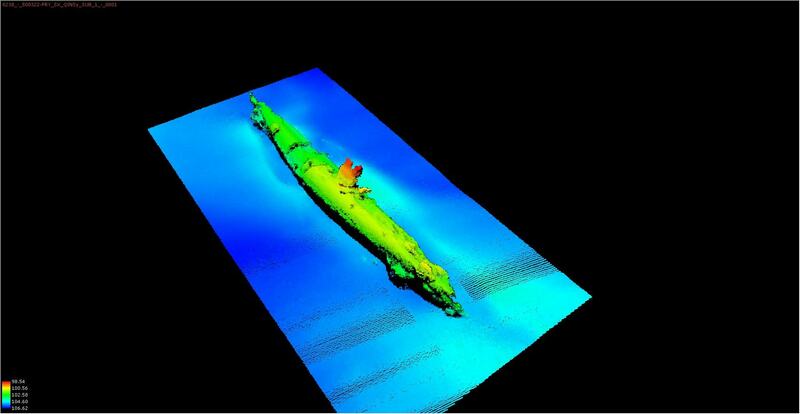 Remarkable sonar images show the missing World War One submarine is largely intact and lying off the Galloway coast. Experts believe the vessel could be the UB-85, a sub that sank in 1918, according to official records. However, naval folklore suggests it may have been attacked by a "sea monster". could be the key to unlocking the alleged "Loch Ness" sinking. The entire crew of the U-boat is reported to have abandoned ship due to the "monster attack". Once aboard the British ship HM Drifter Coreopsis, their commander, Captain Krech described their encounter. He is said to have spoken of a beast with "large eyes, set in a horny sort of skull…with teeth that could be seen glistening in the moonlight". He apparently claimed that the sub was so damaged in its battle with the "monster", it could no longer submerge. However, Dr Innes McCartney, a historian and nautical archaeologist who helped identify the wreckage, does not believe the tale. "In reality, the real sea monster was the U-boat, here trying to sink ships," he said. He added: "The submarine was caught on the surface at night, recharging its batteries. "It saw the patrol ship coming. It attempted to do a crash dive to get away. "Once the submarine was under water, it rapidly started flooding from above so they had no option but to blow all the compressed air they had, bring the submarine to the surface at which point all they could do was surrender." The historian said tales of sea monsters and haunted U-boats came about due to secrecy surrounding exactly what happened during the first U-boat war which meant that period was "ripe for conspiracies". He said the stories were often concocted as a result of journalists and ex-Navy men "talking late at night, after having a nice time". Dr McCartney said there were at least 12 British and German submarines known to have sunk in the Irish Sea. 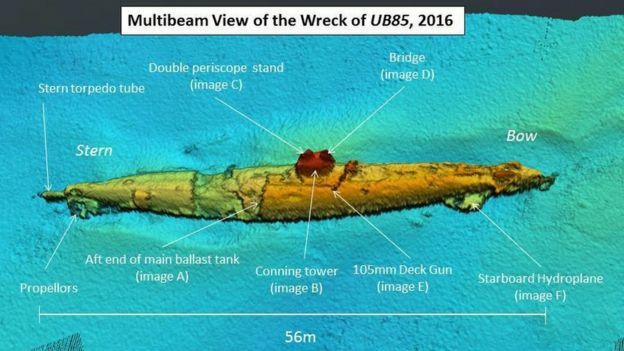 He said: "The features of this particular wreck, which is largely intact, confirm it as a UBIII-Class submarine, of which we know of two which were lost in the area - the more famous UB-85 and its sister boat UB-82. "While I can conclude that this wreck is likely to be one or the other, they would be practically impossible to tell apart, aside from the numbers painted on them in service, now obviously long gone. "Unless a diver can find a shipyard stamp, we cannot say definitively, but yes, we're certainly closer to solving the so-called mystery of UB-85 and the reason behind its sinking - whether common mechanical failure or something that is less easily explained." The historic discovery was made by engineers involved in the £1bn Western Link project to lay a subsea power line between Ayrshire and the Wirral. The 385km (239miles) long cable will carry renewable energy produced in Scotland to England and Wales. 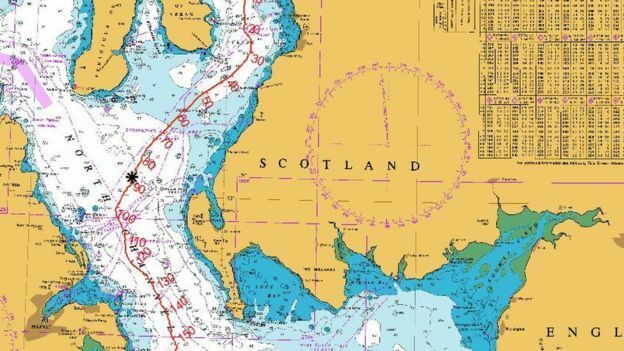 The engineers found the wreckage 120m north-west of the centre of the planned route, off the Stranraer coast. It is about 45m long, with debris spilling from the stern. Gary Campbell, the keeper of the Official Sightings Register of the Loch Ness Monster, said it was "entirely feasible" that a large sea creature disabled the submarine. "The World War One report from the captain of the British ship HMS Hilary a year earlier makes it clear that sea farers at that time were well aware of large sea 'monsters' that could be harmful to their ships," he said. "The area of sea where the attack took place has a history of sea monster sightings - they have ranged from the north coast of Wales to Liverpool Bay. What the German captain said could well be true." The marine cable is approximately 385km long. Scottish Power Transmission and the National Grid are working together on the Western Link project to lay the undersea cable. 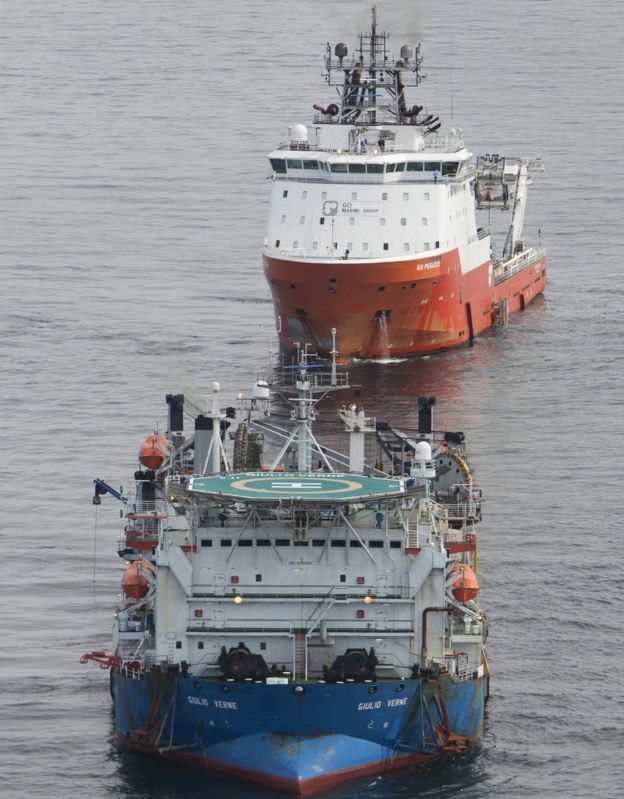 Peter Roper, of Scottish Power, said: "The images we get back from the subsea scans are incredibly detailed, but we obviously need to be aware of what lies beneath before we can start laying a power cable. "In all the years I have been building power lines, I can say that this is the most extraordinary discovery." National Grid's Graham Edwards said: "The Western Link is a very significant project for the UK and has required careful planning in all aspects, but particularly in the laying of high-voltage cables in the sea, where we are working hard to minimise our impact on the environment. "During construction we take great care over archaeology, whether on land or at sea, and it's always exciting to record a significant find and help to shed new light on our history - especially one with such a good tale involved!" Roughly 30 percent of the carbon dioxide produced by humans dissolves into oceans, rivers and lakes, transforming conditions for ocean life for the worse. A new, free virtual reality program allows users to explore what happens as climate change kills off coral reefs. The Stanford Ocean Acidification Experience is a free science education tool that takes students to the bottom of the sea and then fast-forwards their experience to the end of this century, when, as scientists predict, many coral reefs are expected to corrode through ocean acidification. By putting the experience in VR, the collaborators say they are hoping to change people's behavior in the real world. The project came out of Stanford's Virtual Human Interaction Lab, which created a related 360-degree video project that also examines the problem of global warming and its impact on the ocean's life forms. But it's the VR version that allows the viewer to deep-sea dive and collect samples off of the ocean floor. 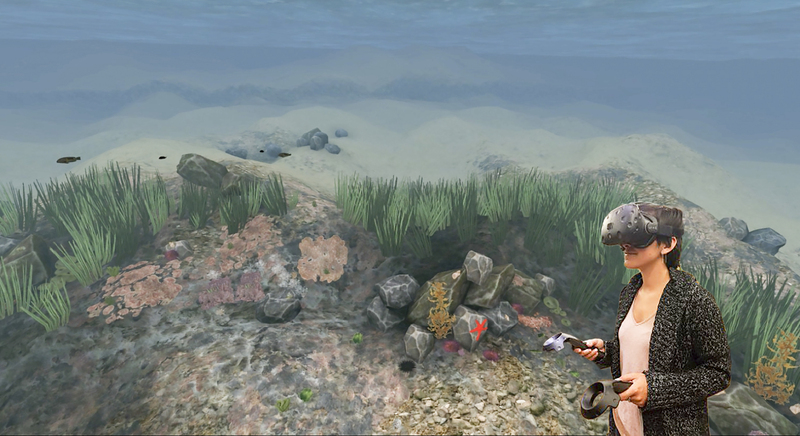 Wearing a virtual reality headset, a researcher tries out the Stanford Ocean Acidification Experience, a new VR science education tool, with coral animation still in background. The simulation places the viewer into heavy traffic, where he or she can follow carbon dioxide molecules as they float from car tailpipes to the sea, where they're absorbed. Then the viewer steps into the waves and moves around coral as it loses its vitality and displays the effects of increasingly acidic water on marine life. A narrator explains what's happening as the story unfolds and encourages the viewer to undertake specific actions, such as a species count. "You're not watching something, you're doing it," said Jeremy Bailenson, founding director of the lab and a communications professor. "You learn by doing. These are magic, teachable moments." The lab created the software in partnership with marine biologists Fiorenza Micheli from Stanford and Kristy Kroeker, formerly at Stanford and now at the University of California, Santa Cruz, as well as Roy Pea, a professor at Stanford's Graduate School of Education. The development process took two years to recreate a virtual replica of an actual rocky reef around the Italian island of Ischia, where underground volcanic vents have been spewing carbon dioxide at the reef. The data collected from that site has allowed researchers to measure the impact on marine life and to extrapolate what effect people's increasing fossil fuel use will have in decades to come. A related video, "The Crystal Reef," filmed in 360 degrees and developed as part of a master's degree project by a lab member, premiered during the Tribeca Film Festival earlier this year. There, people could watch the film on VR headgear. "We had a line of dozens of people for 11 hours a day, six days straight," said Bailenson, in a Stanford article about the project. The VR project has also gone to Washington, where lawmakers and staffers tried it out during a Capitol Hill event organized by non-profit Ocean Conservancy. Among them was Sen. Sheldon Whitehouse of Rhode Island. "This simulation shows in rich detail the damage carbon pollution inflicts on our oceans," said Whitehouse after his viewing. "I appreciate the Stanford Ocean Acidification Experience for calling attention to the peril our oceans face and what we must do to protect them." A combination of sensors and video reveals details about the hunting methods of the largest predators that have ever lived. The study focuses on rorquals, a family of baleen whales that includes blue whales, humpbacks and minke whales. IEEE : Can Stanford’s Deep Dive Into Virtual Reality Help Save the Oceans? Sea level change resulting from Greenland ice melt, derived from NASA GRACE measurements. Black circles show locations of the best historical water level records, which underestimate global average sea level rise due to Greenland melt by about 25 percent. 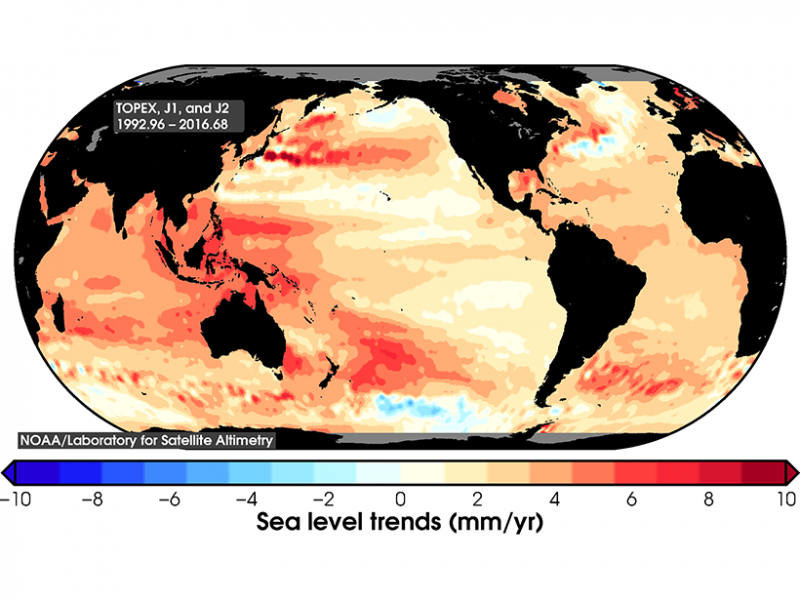 A new NASA and university study using NASA satellite data finds that tide gauges -- the longest and highest-quality records of historical ocean water levels -- may have underestimated the amount of global average sea level rise that occurred during the 20th century. A research team led by Philip Thompson, associate director of the University of Hawaii Sea Level Center in the School of Ocean and Earth Science and Technology, Manoa, evaluated how various processes that cause sea level to change differently in different places may have affected past measurements. The team also included scientists from NASA’s Jet Propulsion Laboratory, Pasadena, California, and Old Dominion University, Norfolk, Virginia. Global mean sea level is rising, but as shown by the satellite data pictured here, the rate of sea level change is not the same everywhere. This presents a challenge when estimating historical average global sea level rise from tide gauges prior to satellite measurements. One of the key processes the researchers looked at is the effect of “ice melt fingerprints,” which are global patterns of sea level change caused by deviations in Earth’s rotation and local gravity that occur when a large ice mass melts. To determine the unique melt fingerprint for glaciers, ice caps and ice sheets, the team used data from NASA’s Gravity Recovery and Climate Experiment (GRACE) satellites on Earth’s changing gravitational field, and a novel modeling tool (developed by study co-author Surendra Adhikari and the JPL team) that simulates how ocean mass is redistributed due to ice melting. One of the most fascinating and counter-intuitive features of these fingerprints is that sea level drops in the vicinity of a melting glacier, instead of rising as might be expected. The loss of ice mass reduces the glacier’s gravitational influence, causing nearby ocean water to migrate away. But far from the glacier, the water it has added to the ocean causes sea level to rise at a much greater rate. During the 20th century, the dominant locations of global ice melt were in the Northern Hemisphere. The results of this study showed that many of the highest-quality historical water level records are taken from places where the melt fingerprints of Northern Hemisphere sources result in reduced local sea level change compared to the global average. Changes in ocean height in the Indian Ocean (2004-2014). Darker reds indicate faster rate of rise. Furthermore, the scientists found that factors capable of enhancing sea level rise at these locations, such as wind or Southern Hemisphere melt, were not likely to have counteracted the impact of fingerprints from Northern Hemisphere ice melt. The study concludes it is highly unlikely that global average sea level rose less than 5.5 inches (14 centimeters) during the 20th century. The most likely amount was closer to 6.7 inches (17 centimeters). “This is really important, because it provides answers to the question about how melt fingerprints and the influence of wind on ocean circulation affect our ability to estimate past sea level rise,” said Thompson. Results are published in Geophysical Research Letters. Antarctica’s surrounding waters are home to some of the healthiest marine ecosystems on Earth, but efforts to establish conservation areas in the Southern Ocean are being hobbled by political infighting and fishing interests. Efforts to adopt effective marine protected areas in the Southern Ocean, a global commons containing the world’s most pristine marine ecosystems, are being thwarted by political infighting and fishing interests. Antarctica’s surrounding waters are home to some of the healthiest marine ecosystems on Earth and support thriving populations of krill, seabirds, fish and whales. But efforts to establish a network of effective Marine Protected Areas (MPAs) in the Southern Ocean are being hobbled by political infighting and demands that prioritize fishing interests over conservation by members of the international consortium tasked with conserving the region, Stanford scientists say. The Commission for the Conservation of Antarctic Marine Living Resources (CCAMLR) is currently considering the adoption of marine protected areas (MPAs) in the Southern Ocean. The findings, published Oct.14 in Science, come as 24 countries and the European Union convene in Hobart, Australia, next week for the annual meeting of the Commission for the Conservation of Antarctic Marine Living Resources (CCAMLR), to resume negotiations of Southern Ocean MPAs. “Our research shows that CCAMLR’s positions for and against MPAs have become entrenched,” said lead author Cassandra Brooks, a PhD candidate at Stanford School of Earth, Energy & Environmental Sciences. The authors argue that as a leader in international fisheries management, CCAMLR has the opportunity to set an example for ongoing negotiations at the United Nations level to develop a legal instrument for conserving biodiversity in international waters, also known as the high seas. But if CCAMLR continues to fall short in its duties, it could set a sorry example with ramifications for marine protection in other parts of the world, said study co-author Kristina Gjerde, a legal scholar at the International Union for Conservation of Nature (IUCN). “It would send the message that fishing interests trump conservation, despite the global interests at stake,” Gjerde said. “It could raise doubts that nations will be able to set aside short-term national interests to confront global ocean challenges stemming from accelerating climate change. Despite more than a decade of international negotiations informed by robust scientific planning, CCAMLR has failed to meet its goal of adopting a system of MPAs in the Southern Ocean to conserve biodiversity in the face of threats from climate change and potential overfishing, the authors say. 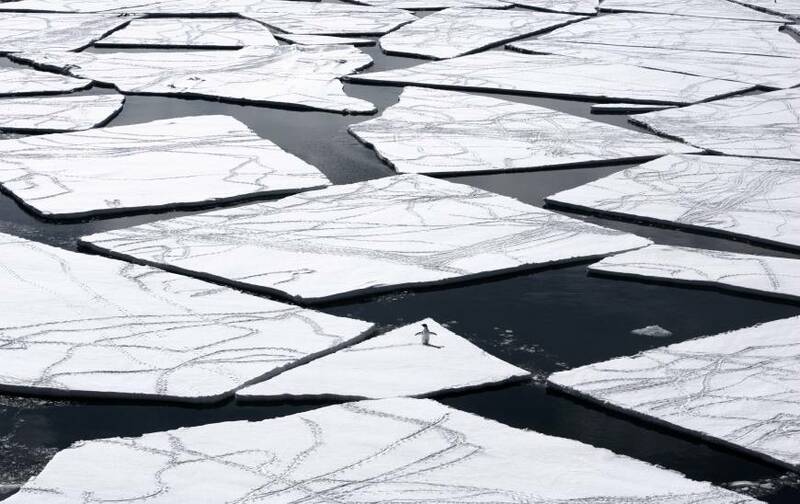 A major obstacle is agreement about the concept of “rational use,” which sets the terms under which CCAMLR’s member nations are allowed to fish in the Southern Ocean. The region contains some of Earth’s least exploited fish stocks, and its large populations of krill – small crustaceans that are food for the region’s fish, seabirds and whales – and toothfish have made it an increasingly prized fishing spot. Krill is valuable as fishmeal and for making health supplements, and toothfish are sold as lucrative “Chilean sea bass” around the world. As originally defined, rational use required that fishing not cause irreversible damage to the greater marine ecosystems of the Southern Ocean and for precautionary catch limits and scientific oversight to be set in place. But as the number of CCAMLR’s fishing nations has grown, and as pressure increases to secure access to current and future resources in the Southern Ocean, some nations are pushing to equate rational use with the unfettered right to fish. Countries such as China and Russia have argued against MPA proposals that in any way restrict fishing and demand sufficient evidence to show that fishing threatens ecosystems. “MPA opponents want to reverse the burden of proof,” said co-author Larry Crowder, science director of the Center for Ocean Solutions in Monterey, California, and a fellow at the Stanford Woods Institute for the Environment. “When rational use was first negotiated, the whole idea was that you needed data in order to fish. 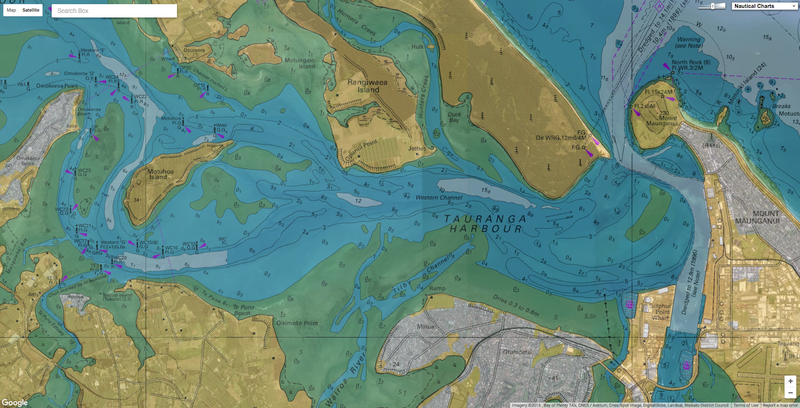 Sunset clauses on the MPAs are another source of fierce debate. MPAs are usually established in perpetuity, but some CCAMLR member nations are advocating that Southern Ocean MPAs have built-in expiration dates ranging from 20 to 30 years. “Twenty years is shorter than the lifespan of most Antarctic predators which the MPAs are proposing to protect,” Brooks said. But not only are sunset clauses inconsistent with the stated goals of MPAs, they do not meet internationally established criteria for protected areas and may not qualify for global MPA targets, the authors warn. Broader geopolitics have also infiltrated CCAMLR negotiations, the authors say. For example, poor international relations between nations – such as tensions between Russia and the United States over Crimea – seem to be spilling into the negotiating room. Nations opposing MPAs are being accused of not negotiating in good faith, while proponents of MPAs are accused of using MPAs a political tool. “The result is a breakdown of trust between member nations, causing a stalemate over MPAs,” Crowder said. 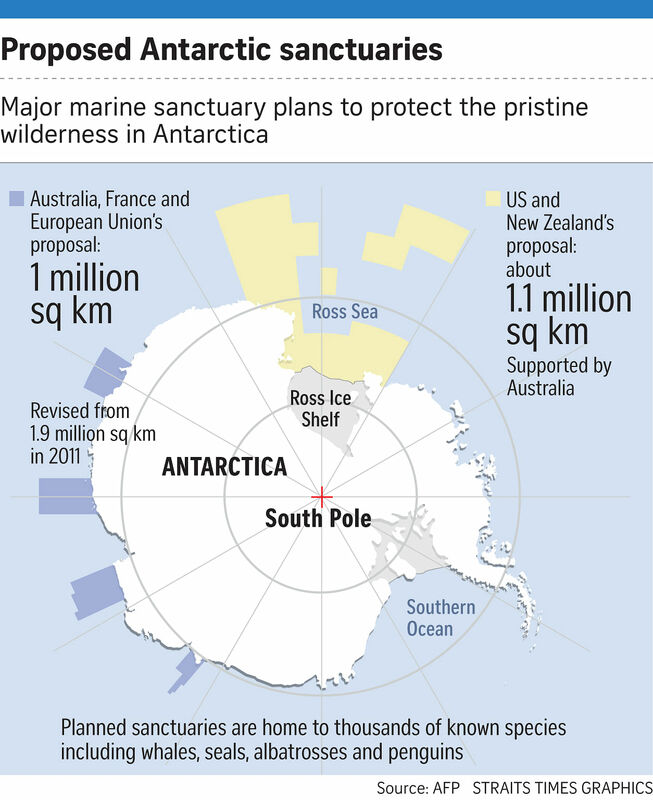 Campaign to have the Ross Sea, Antarctica declared a marine reserve protected area. Two large MPAs are currently being negotiated at CCAMLR: one in the East Antarctic and one in the Ross Sea – a region that has been deemed “The Last Ocean” because it is perhaps the healthiest large marine ecosystem left on the planet. “We’ve seen an East Antarctic and Ross Sea MPA come to CCAMLR’s decision-making table five times now without being adopted. Next week will be the sixth,” Brooks said. With CCAMLR meetings set to resume on Oct. 17, Brooks and her co-authors urge member nations to find a way forward in upholding their mandate and meeting their commitment toward MPAs. “The Southern Ocean is our best-case scenario,” Brooks said. Other co-authors on the paper, “Science-based management in decline in the Southern Ocean,” include Robert Dunbar of Stanford School of Earth, Energy & Environmental Sciences; Lisa Curran, Stanford professor of anthropology and a fellow at the Stanford Woods Institute for the Environment; David Ainley of H.T. Harvey & Associates; Klaus Dodds of the Royal Holloway University of London; and Rashid Sumaila of the University of British Columbia. Bill McGuire on the influence of climate change on geological systems, the link between episodes of major climate transition and geohazards (2012). Small changes in the Earth's crust can potentially trigger large hazards such as earthquakes and volcanoes. Devastating hurricane? More than 1,000 lives lost? It must be climate change! Almost inevitably, Hurricane Matthew’s recent rampage across the Caribbean and south-eastern US has been fingered by some as a backlash of global warming driven by humanity’s polluting activities, but does this really stack up? Blame for a single storm cannot be laid at climate change’s door, as reinforced by the bigger picture. The current hurricane season is by no means extraordinary, and the last few seasons have actually been very tame. The 2013 season saw no major hurricanes at all and tied with 1982 for the fewest hurricanes since 1930. This, in turn, is no big deal as there is great year-on-year variability in the level of hurricane activity, which responds to various natural factors such as El Niño and the so-called Atlantic Multidecadal Oscillation, as well as the progressive warming of the oceans as climate change bites harder. The current consensus holds that while a warmer world will not necessarily mean more hurricanes, it will see a rise in the frequency of the most powerful, and therefore more destructive, variety. This view was supported recently by Kerry Emanuel, a hurricane scientist at MIT, who pointed to Matthew as a likely sign of things to come. Debate within the hurricane science community has in recent decades been almost as hostile as the storms themselves, with researchers, on occasion, even refusing to sit on the same panels at conferences. At the heart of this sometimes acrimonious dispute has been the validity of the Atlantic hurricane record and the robustness of the idea that hurricane activity had been broadly ratcheting up since the 1980s. Now, the weight of evidence looks to have come down on the side of a broad and significant increase in hurricane activity that is primarily driven by progressive warming of the climate. For many, the bottom line is the sea surface temperature, which is a major driver of hurricane activity and storm intensification. Last year saw the warmest sea temperatures on record, so it should not be a surprise. As Michael Mann, an atmospheric scientist at Penn State University, says: “It isn’t a coincidence that we’ve seen the strongest hurricane in both hemispheres [western and eastern] within the last year.” As the Atlantic continues to heat up, the trend is widely expected to be towards more powerful and wetter storms, so that Matthew might seem like pretty small beer when looked back on from the mid-century. As with hurricanes, Pacific typhoons and the mid-latitude storms that periodically batter the UK and Europe are forecast to follow a similar pattern in an anthropogenically warmed world. Storm numbers may not rise, but there is likely to be an escalation in the frequency of the bigger storm systems, which tend to be the most destructive. An additional concern is that mid-latitude storms may become clustered, bringing the prospect of extended periods of damaging and disruptive winds. The jury is out on whether climate change will drive up the number of smaller, but potentially ruinous vortices of solid wind that make up tornadoes, although an apparent trend in the US towards more powerful storms has been blamed by some on a warming atmosphere. Tornadoes, typhoons, hurricanes and mid-latitude storms – along with heatwaves and floods – are widely regarded as climate change’s shock troops; forecast to accelerate the destruction, loss of life and financial pain as planet Earth continues to heat up. It would be wrong to imagine, however, that climate change and the extreme events it drives are all about higher temperatures and a bit more wind and rain. The atmosphere is far from isolated and interacts with other elements of the so-called “Earth system”, such as the oceans, ice caps and even the ground beneath our feet, in complex and often unexpected ways capable of making our world more dangerous. We are pretty familiar with the idea that the oceans swell as a consequence of the plunging atmospheric pressure at the heart of powerful storms, building surges driven onshore by high winds that can be massively destructive. Similarly, it does not stretch the imagination to appreciate that a warmer atmosphere promotes greater melting of the polar ice caps, thereby raising sea levels and increasing the risk of coastal flooding. But, more extraordinarily, the thin layer of gases that hosts the weather and fosters global warming really does interact with the solid Earth – the so-called geosphere — in such a way as to make climate change an even bigger threat. This relationship is marvellously illustrated by a piece of research published in the journal Nature in 2009 by Chi-Ching Liu of the Institute of Earth Sciences at Taipei’s Academia Sinica. In the paper, Liu and his colleagues provided convincing evidence for a link between typhoons barrelling across Taiwan and the timing of small earthquakes beneath the island. Their take on the connection is that the reduced atmospheric pressure that characterises these powerful Pacific equivalents of hurricanes is sufficient to allow earthquake faults deep within the crust to move more easily and release accumulated strain. This may sound far fetched, but an earthquake fault that is primed and ready to go is like a coiled spring, and as geophysicist John McCloskey of the University of Ulster is fond of pointing out, all that is needed to set it off is – quite literally – “the pressure of a handshake”. Perhaps even more astonishingly, Liu and his team proposed that storms might act as safety valves, repeatedly short-circuiting the buildup of dangerous levels of strain that otherwise could eventually instigate large, destructive earthquakes. This might explain, the researchers say, why the contact between the Eurasian and Philippine Sea tectonic plates, in the vicinity of Taiwan, has far less in the way of major quakes than further north where the plate boundary swings past Japan. In a similar vein, it seems that the huge volume of rain dumped by tropical cyclones, leading to severe flooding, may also be linked to earthquakes. The University of Miami’s Shimon Wdowinski has noticed that in some parts of the tropics – Taiwan included – large earthquakes have a tendency to follow exceptionally wet hurricanes or typhoons, most notably the devastating quake that took up to 220,000 lives in Haiti in 2010. It is possible that floodwaters are lubricating fault planes, but Wdowinski has another explanation. He thinks that the erosion of landslides caused by the torrential rains acts to reduce the weight on any fault below, allowing it to move more easily. It has been known for some time that rainfall also influences the pattern of earthquake activity in the Himalayas, where the 2015 Nepal earthquake took close to 9,000 lives, and where the threat of future devastating quakes is very high. During the summer monsoon season, prodigious quantities of rain soak into the lowlands of the Indo-Gangetic plain, immediately to the south of the mountain range, which then slowly drains away over the next few months. This annual rainwater loading and unloading of the crust is mirrored by the level of earthquake activity, which is significantly lower during the summer months than during the winter. And it isn’t only earthquake faults that today’s storms and torrential rains are capable of shaking up. Volcanoes seem to be susceptible too. On the Caribbean island of Montserrat, heavy rains have been implicated in triggering eruptions of the active lava dome that dominates the Soufrière Hills volcano. Stranger still, Alaska’s Pavlof volcano appears to respond not to wind or rain, but to tiny seasonal changes in sea level. The volcano seems to prefer to erupt in the late autumn and winter, when weather patterns are such that water levels adjacent to this coastal volcano climb by a few tens of centimetres. This is enough to bend the crust beneath the volcano, allowing magma to be squeezed out, according to geophysicist Steve McNutt of the University of South Florida, “like toothpaste out of a tube”. If today’s weather can bring forth earthquakes and magma from the Earth’s crust, it doesn’t take much to imagine how the solid Earth is likely to respond to the large-scale environmental adjustments that accompany rapid climate change. In fact, we don’t have to imagine at all. The last time our world experienced serious warming was at the end of the last ice age when, between about 20,000 and 10,000 years ago, temperatures rose by six degrees centigrade, melting the great continental ice sheets and pushing up sea levels by more than 120m. These huge changes triggered geological mayhem. As the kilometres-thick Scandinavian ice sheet vanished, the faults beneath released the accumulated strain of tens of millennia, spawning massive magnitude eight earthquakes. Quakes of this scale are taken for granted today around the Pacific Ocean’s “Ring of Fire”, but they are completely out of place in Santa’s Lapland. Across the Norwegian Sea, in Iceland, the volcanoes long buried beneath a kilometre of ice were also rejuvenated as the suffocating ice load melted away, prompting a “volcano storm” about 12,000 years ago that saw the level of activity increase by up to 50 times. Now, global average temperatures are shooting up again and are already more than one degree centigrade higher than during preindustrial times. It should come as no surprise that the solid Earth is starting to respond once more. In southern Alaska, which has in places lost a vertical kilometre of ice cover, the reduced load on the crust is already increasing the level of seismic activity. In high mountain ranges across the world from the Caucasus in the north to New Zealand’s southern Alps, longer and more intense heatwaves are melting the ice and thawing the permafrost that keeps mountain faces intact, leading to a rise in major landslides. Does this all mean that we are in for a more geologically active future as well as a hotter and meteorologically more violent one? Well, no one is suggesting that we will see a great surge in the number of earthquakes and volcanic eruptions. As always, these will be controlled largely by local geological conditions. Where an earthquake fault or volcano is primed and ready to go, however, climate change may provide that extra helping hand that brings forward the timing of a quake or eruption that would eventually have happened anyway. As the world continues to heat up, any geological response is likely to be most obvious where climate change is driving the biggest environmental changes – for example, in areas where ice and permafrost are vanishing fast, or in coastal regions where rising sea levels will play an increasing role. Freysteinn Sigmundsson of the Nordic Volcanological Centre observes that the centre of Iceland is now rising by more than three centimetres a year in response to shrinking glaciers. Studies undertaken by Sigmundsson and his colleagues forecast that the reduced pressures that result will lead to the formation of significant volumes of new magma deep under Iceland. Whether this will translate into more or bigger eruptions remains uncertain, but the aviation chaos that arose from the Eyjafjallajökull eruption in 2010 provides a salutary warning of the disruption that any future increase in Icelandic volcanic activity may cause across the North Atlantic region. Volcanologist Hugh Tuffen, of Lancaster University, is worried about the stability of the more than 10% of active volcanoes that are ice-covered. The potential for more landslides is also likely to be a problem in high mountain ranges as the ice cover that stabilises rock faces vanishes. Christian Huggel of the University of Zurich has warned that “in densely populated and developed regions such as the European Alps, serious consequences have to be considered from [future] large slope failures”. Looking ahead, one of the key places to watch will be Greenland, where recent findings by a research team led by Shfaqat Khan of Denmark’s Technical University reveal a staggering loss of 272bn tonnes of ice a year over the last decade. GPS measurements show that, like Scandinavia at the end of the last ice age, Greenland and the whole of the surrounding region is already rising in response to the removal of this ice load. Andrea Hampel of the University of Hannover’s Geological Institute, who with colleagues has been studying this behaviour, is concerned that “future ice loss may trigger earthquakes of intermediate to large magnitude if the crust underneath the modern ice cap contains faults prone to failure”. More earthquakes in Greenland might not seem like a big deal, but this could have far wider ramifications. About 8,200 years ago, an earthquake linked to the uplift of Scandinavia, triggered the Storegga Slide; a gigantic undersea sediment slide that sent a tsunami racing across the North Atlantic. Run-up heights were more than 20m in the Shetlands and six metres along the east coast of Scotland, and the event has been blamed for the flooding of Doggerland; the inhabited Mesolithic landmass that occupied what is now the southern North Sea. The submerged margins of Greenland are currently not very well mapped, so the likelihood of a future earthquake triggering a landslide capable of generating a major tsunami in the North Atlantic is unknown. Dave Tappin, a tsunami expert at the British Geological Survey, points out that one large, undersea landslide has been identified off the coast of Greenland, but suspects that there may not be sufficient sediment to generate landslides as large as Storegga. Nonetheless, the seismic revival of Greenland is certainly a geological response to climate change that we need to keep an eye on. The bottom line in all of this is that as climate change tightens its grip, we should certainly contemplate more and bigger Hurricane Matthews. However, when it comes to the manifold hazardous by-blows of an overheating planet, and especially those involving the ground we stand on, we must also be prepared to expect the unexpected. YouTube : Bill McGuire, author of 'Waking the Giant: How a changing climate triggers earthquakes, tsunamis, and volcanoes', discusses the topics raised in his book.